I ritually hand-magnetized my crystal ball this evening, with the waning gibbous moon 74% full during the planetary hours of the moon and Saturn. Following the magnetization ritual, I gazed into the sphere's depths expecting to see "cloudy" forms. Cloudy forms are not what I saw. In the soft candlelight, the candlelight and shadows came immediately together in such a way as to form the clear image of an old large wooden table (like one from the middle ages) with a steaming iron cauldron set in the middle of it. Behind both of them was a firelit hearth with a broomstick resting beside it. The formation was so clear and distinct - even the darkness of the "wood" and iron cauldron. The soothing energy of the experience tenderly embraced me, leaving me feeling deeply satisfied inside. I have a "wind" chime in my magic room that operates on electromagnetism. It operates using an electric current and a magnet. Sometimes, even though the current is always on, the wind chime doesn't always work - the magnetic pendulum fails to be moved by the current sufficiently to strike the chimes. The chime has not been working for several days. Suddenly today, it is working just fine again. Right now I am listening the soothing peaceful sound of my chimes. This has occurred several times - it works, then it doesn't for a few days or weeks. Then, suddenly it works fine again. Whatever recently has been "in the air" adversely impacting the functional ability of my electromagnetic "wind" chime is no longer present. I welcome the sound of my chime's gentle music back into my magic room. I've missed it. What could be causing this phenomenon? Is it happening via cyclic influences on the electric current? What would cause the magnetic domains within the magnet to autonomously dis-align and realign with the earth's magnetic field cyclically and randomly like it does? Maybe it isn't random, even though it is cyclical. I'm going to start documenting these periods. What is "in the air" impacting my chimes? I want to know, as my chimes have now "stopped" again as I complete this post and I'm not happy about it. But I am happy again, nevertheless, as a mere few words later, my new magic chamsa kabbalah bracelet from Israel just arrived. And with it, my chimes started working again. Yerech is the place of conception (see also Rashi Bamidbar 5:20 D"H Es Yirecheich), Yerusha which is mainly from the father is expressed as the leg which is an extension of the body. Taking all this together, my dream is telling me of "the wrestling match" of my "husband" where the "guardian angel" of Esau struck at my head using the discarded weapon of Yishmael. Esau's angel sought to strike me through the place of conception of holy or unholy language (the difference between the two being good-will or ill-will). Had I been struck, all in the car would have been splattered with my blood and the shadow of murder (which would have stained Esau's guard as well). Importantly, the guardian of Esau could not wound us. Had we harbored ill-will and been a genuine threat to Esau, the guard would have been able to harm us. So even more importantly than highlighting the failure to wound, perhaps my dream is establishing a foundation of trust for the children of Yaakov (as we were not harmed in the Arab couple's home), the children of Yishmael (as we came without any weapons) and the children of Esau (as the guardian angel could find no way to legitimately harm us as we harbored no ill-will). My "husband" and I were visiting an Arab family somewhere here in the U.S. My "husband" and I were Israeli-Americans in the dream. We were going on a recreational outing with the Arab man and his wife as two couples. To where, I didn't know. It was daytime. We had been invited into their home to wait as they settled their children to stay with older siblings while we went on our outing. We took the Arab couple's car. The two men were in the front seat and the man's wife and I sat in the back seat. We had to make a quick stop somewhere before we proceeded on to our recreational destination. The Arab man got out of the car at a place that looked like the entrance gate to an industrial factory. He spoke with one of the guards that occupied the booth at the entrance gate. He sold the guard his machine gun and got back inside the car. As we were driving away, the guard at the entrance booth shot toward the car. He was shooting at me. "It's okay, don't worry, there were only blanks in the gun", the Arab man told us. But that was not right. The shots being fired from the gun were live bullets. "See", I said, indicating the dents in the back windshield where the bullets had struck the back windshield right behind my head. Five bullet dents were there from the five shots that had been shot toward my head. I saw 4 of the dents being made as the guard man shot at me. The first one I had not seen as I had not been facing the back windshield to see it. The glass had not allowed the bullets to penetrate into the car - it must have been bulletproof glass. Nevertheless, the bullets had been live. Whether the blanks had been removed and the gun loaded with live bullets by the guard or whether there had always only been live bullets in the gun - I didn't know. The "guard in the booth at the entrance gate to the factory" - this person/office is dangerous. 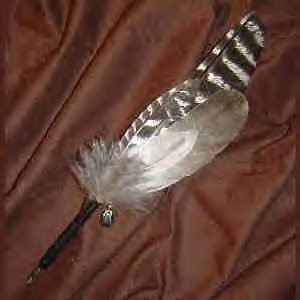 My handmade Shades Of Grey quill pen to be used for spellwork and writing in my Book Of Shadows arrived today. Yay! It's exquisite! It's gorgeous! Well worth the wait! Acting with the energy of the lights of Tohu, in vessels of Tikkun ... because I can. This shabbat full moon esbat at 6:33 am, I woke up and wrote down the major symbols of a complex dream so I would remember them. "I claim the zayin for now." In other words, while both letters were "mine", I indicated the one acting "for now" was the letter zayin. There was another hidden letter as well. Each letter was associated in some manner with a different and specific aspect of a dandelion. As I was waking from the dream, I clearly heard a word pronounced like "sern", spelled in English either as "sern" (like the enterotoxin-like microbial gene studied in medical research laboratories) or "cern" (like the high-energy particle physics laboratory). Both Sern and Cern pertain to "states in between" - the former (sern) to a place "in between" being a distinct toxin "code" or being distinctly non-toxin "code", and the latter (cern) to quantum non-localized fuzzy states existing "in between" distinct places in space. Like klipat nogah, both "sern" and "cern" point to a tachash state of being. When I woke up from the dream, I remembered clearly that someone had been messing with my instrumental music CDs in my office at work. One of my CDs called Wishes has a dandelion on it - I noticed it had been moved slightly when I went in to work yesterday morning and returned it to its place. Interestingly, this dream follows the initial act shabbat evening of naming time according to the Witches' Year in parallel with the Hebrew date. The first Witches' calendar date I used for posting entries is today Shamash 16, where Shamash has correspondences to dandelion, the color yellow, the sefirah Tiferet, Hebrew Shemesh and the Hebrew letter meaning "door" (dalet ד). The path of the Just is a great shining light emerging from within darkness. Raising up sparks with Real Magic In Shades Of Grey by me. I had a dream last night about a prison. I was camping out in the lobby sort of, got up morningtime and walked out into the street. I wasn't behind prison bars at any point in the dream - it was almost as if I had been "waiting" for something or someone to be released. This particular configuration of letters follows previous entries dealing with "A Bud Appeared In The Land", "Secrets In My Soul" and "Kochava D'Shavit". The prefix letter ה, as the "source of all the letters" yesh m'ein, gives birth to the entire array of creation energies (all the letters of the aleph-beit) and implies specificity in those letters which follow the prefix. In other words, the newly born creative energies are being specifically (as opposed to generally) directed. The sha'ar נב means "to grow" and "to flourish". Specifically, given the previous entries as linked above, what is being empowered to grow and to flourish is the soul-root of messianic consciousness, symbolized through the phrases "kochava d'shavit" and "the missing/hidden letter". It is not only going to grow and develop, it is going to flourish. Here is an artistic graphic of my bronze Jewitch star, my kochava d'shavit, which symbolically represents the two primary soul sparks of my Jewish neshamah - Dinah (the encircled hexagram of David) and King Solomon (the pentacle of Solomon) in Unity. In my previous post regarding the legacy of my grandmother Gladys Ruth Faulkner-Collins, daughter of Elizabeth Grunwald-Faulkner and George Samuel Faulkner, and granddaughter of Sue Turner-Grunwald and Will Grunwald, I noted that my grandmother has four daughters, each daughter corresponding to one of the Jewish matriarchs - Sarah, Rivkah, Leah and Rachel. My mother, as the third daughter of my grandmother, corresponds to the matriarch Leah. I am my mother's only daughter, just as Dinah the daughter of Leah, is Yaakov's only recorded daughter. Thus, from this perspective, my particular soul has a significant root in the soul of Dinah (as well as Ruth and Leah roots). My grandmother, Gladys Ruth, was born in Rosebud, IL. I, containing the soul of Dinah, the only recorded daughter of Yaakov and Leah, was born in Danville, IL. From a second perspective, both Sue and Will Grunwald were observant Jews by family oral history. There is nothing in our family oral history to suggest that Sue was not born Jewish, and both reportedly lived Jewishly. Nevertheless, let's consider that Sue may have been a convert (as opposed to a "born" Jew), and correspond Sue Grunwald to Ruth, a central name given to my grandmother Gladys. Ruth is the great grandmother of King David and great great grandmother of King Solomon. Sue is the great grandmother of my mother Cheryl and my great great grandmother. Thus, from this perspective, my particular soul has a significant root in the soul of King Solomon (as well as Ruth, Leah and Yaakov, and Dinah). Interestingly, Solomon's name in Hebrew is a feminine form - שלמה. Taking all this together, the dynamic relationships in my family tree suggest that my particular Jewish soul contains the soul sparks of Ruth, Leah, Yaakov, Dinah, King David and King Solomon (where Mashiach ben David represents tikkun of the nachash). Of these 6 sparks, those of Dinah and King Solomon emerge as 2 significant sparks of my own soul's Jewish particularity. The dabak is in the details. Gladys Ruth Faulkner-Collins, daughter of Elizabeth Grunwald-Faulkner and George Samuel Faulkner, and granddaughter of Sue Turner-Grunwald and Will Grunwald was born in Rosebud, Illinois on August 5, 1915. One of her final gifts to her four daughters was to say "I love my beautiful, beautiful daughters! We've told a beautiful story, haven't we?" She was a gift we will cherish forever. She is survived by her daughters, Elizabeth Satterlee, Brenda Davis, Cheryl Taylor and Karen Bell. She also leaves behind eight grandchildren, nine great grandchildren, and eight great-great grandchildren. A bud appeared in the Land ... Shir Hashirim 2:12 ... the time of singing has come, and the voice of the turtle is heard in our Land. Through my mothers are "the powers of evil annihilated" and the destruction of generations prevented. Because buds appeared in the Land. Yes, Grandma, a very beautiful story. The Jewish Press reports that 13 Austrian bishops were recently denied entrance to the kotel because they would not put their crosses inside their robes. This is not right. I feel very strongly that it is a terrible thing to oppress another's expression of personal religious identity. Oppression, the antithesis of holiness, especially does not belong at the kotel. There was some teaching event going on in a nearby town with a "tzadik". Only a limited number of "seats at the table" were available. The table which was shaped like the letter kaf (כ). The open end of the kaf was toward the east wall where the doorway of the room was also located. My mother and I had acquired seats at the table. We sat next to one another on the north side of the room which was also the bottom leg of the kaf-table. The seats at the table filled up and no more were available. The "tzadik" sat by the western wall of the room, in the center of the curve of the kaf-table. Before class started, while the room was being cleared of those who couldn't find seats, he got up from his seat and walked down the inner-side northern leg of table seats to see and/or speak with the students who occupied the places on this leg of the table. Coming down the leg (my mother and I sat in the center of the northern leg), he came to my mother first. He and my mother spoke as he was looking through her class materials - my mother's papers and my papers were kind of mixed together, but we were separating them into our own separate little piles of papers as he was talking. We had been in a hurry to get there in order to get seats and had thrown our papers together into one carry pack to save time. We had figured there would be time before class started to separate and organize our papers. If we had done that first before we had left to attend the class, we may have missed getting a seat. As it turned out, we got our seats at the table, and there was time to before class started to separate and organize our papers after all. Our papers were in order now and the signal for class to begin was given. Somehow, I'm not surprised. I was told a few weeks ago at work to "dumb down" my clinical care plans. I don't get it. I'm not a genius. Ok, I was in an advanced reading class in gradeschool, but I don't think that counts, even though my parents were told at that time that I had an above-average IQ (or so I am told). Other than the advanced reading class, my parents wouldn't let the school system place me in any other advanced classes - they thought I'd turn out "not normal" if they allowed it. I turned out "not normal" anyway, even if I'm not really a genius. It seems Britain is far ahead of the United States in providing its citizens "cultural flexitime" at their places of employment as a human resources "standard" policy. Civil servants will be able to take bank holidays on the religious days of their choice under moves to introduce "cultural flexitime". Officials in the education department will be allowed to work from home on statutory days off and take the time owed to mark their own religious traditions. It means staff will be able to work at home on Christmas Day for the first time this year and swap it for a different religious festival such as Eid or Diwali. The pioneering arrangements also apply to cultural traditions, meaning a Welsh employee could move a bank holiday to St David's Day. Some public bodies and firms already offer similar arrangements, such as allowing Christian holidays to be exchanged for festivals from other religions. Staff will be able to switch all eight statutory days off, including Christmas, Easter and secular bank holidays. The arrangements also apply to minority religions such as Baha'i and Zoroastrianism, and staff could ask for time off to mark pagan festivals such as the summer solstice. Staff choosing to swap bank holidays for other key dates will not be required to prove that they follow a different faith. "As a progressive department, we are more than pleased to meet the request, as we believe it's both good for employees and the business." Completely wow! Progressive at it's best! The fourfold division of the world, and its further subdivision into eight directions known as airts is derived directly from the structure of the human body and its interaction with the physical structure and processes of the planet upon which we evolved and upon which we live. According to Druidic teachings, there are 12 airts or "winds of the directions". In my mind, these 12 Druidic airts (the fourfold division and the eight "directions" evolving from the division) correspond to the 12 elemental letters (shteym esarah pshutot) as described in Sefer Yetzirah 5:2 as 12 diagonal "Boundaries" or "Arms" of the Universe, which parallel the 12 "tribes" of Yisrael. According to Sefer Yetzirah, above the "Arms of the Universe" is the "Place" of the Universe. Interestingly, in my dream, also posted earlier today, the lethal stormclouds were "passing over" my "locations", yet I was in a Hiding Place, where "Place" refers to a singular unified description of "locations" (where locations correspond to the infinite "Boundaries of the Universe"). As I was posting the earlier entry, I was perplexed of perception as to why "locations" was clearly the symbolism expressed in my dream as associated with the limited "sight" of the stormclouds. Thus, while it emerges that the stormclouds operated over the level of "locations", at the level of Place, looking for me, I was safely over even that, Dwelling in my "Hiding Place" "from where" I rode out (or outrode) the storm. Writing and symbols, art and architechture, technology and warfare are all structured according to the human body. The fourfold division of the world, and its further subdivision into eight directions known as airts is derived directly from the structure of the human body and its interaction [emphasis mine] with the physical structure and processes of the planet upon which we evolved and upon which we live. At the centre of this fourfold division is the individual person, the source, fount and origin, the naval, the relic of the point from which each of us developed as an embryo within our mother. Naval points in the landscape [of feminine malchut, for example - my addition] are known in geomantic terminology by its Greek name omphalos. This terminology, calling the central point a naval, reiterates the slain giant motif of the primal creation of the world, where each part of the human being is reflected in its corresponding structure in the world. In human beings, the naval is the vestige of the umbilical cord which once connected the unborn baby to the placenta in the mother's womb. Through the omphalos, the material world is linked by a cosmic axis "upwards" to the creative, generative upperworld and downward to its complimentary opposite, the degenerative or destructive underworld. This pattern of a centre in this world linked by an axis to the upper world above and the netherworld below is the basis for traditional sacred cosmology. It exists throughout the world in different cultural contexts. It is the stable structure of society without which there is disorder and disintegration. The determination of such a powerful cosmic centre [the teli - my addition], so vitally important in psychological as well as social terms, was one of the major tasks of the augur or locator - many folk tales recall these arduous quests. Such is the mystery of the relationship between microcosm and macrocosm, "as above, so below". The central naval of the earth, symbolically represents the fixed point at which other states of consciousness and spiritual evolution may be attained by those attuned to such things by dint of personal effort or divine designation. The discovery of such a place of symbolic power, its definition and the geomantic act is enshrined in the mythos of dragonslaying in the stories of such luminaries as the Pagan heroes Cadmus, Siegfried and Beowulf, and in the Christian mythology, saints such as Beatus, George, Leonard, Martha and Michael and knights like Lord Lambton [and in Judaic stories such as David and Goliath - my addition]. In each of these legends, the dragon, wyrm or serpent that is killed is often taken to symbolise the earth energies which, sensitive people assert, roam, bewilderingly and dangerously free in the soil and the underlying rock formations beneath our feet. In traditional society, the determination of the most powerful and appropriate location for the fixation of these geomantic energies was the task of the locator. After long and meticulous scrutiny of the site, [the locator] would decide upon the correct time to undertake the geomantic act. According to geomantic symbolism, at the designated instant, when the forces were at their most malleable, and when the energies could best be tamed, the locator would drive a peg or staff, or perhaps a lance or sword into the earth as the culmination of the foundation ceremony. All would be applied with the greatest care to ensure the efficacy of the geomantic act. Piercing the ground at the optimal location appears to fix these wandering energies permanently in an accessible place ... commonly called a place of power. Many depictions of the geomantic act show the hero or heroine [emphasis mine] transfixing the dragon with a stave, sword or spear, which frequently runs through the head to pin it to the ground below [like Yael of "a mother in Yisrael" fame in Torah - my addition]. Symbolically, King Arthur's withdrawal of the sword from the stone to assert his right of kingship of Britain, is a reversal of the geomantic act. In removing the sword, Arthur frees the dragon power which, as Pendragon himself, the king can control. It appears to be of no coincidence that Arthur's military successes against the Saxon invader, were [like a wandering Jew - my addition] in mobile calvary warfare, not in static and centered defense. After my grandmother's passing this past Halloween morning October 31, the date Samhain is typically observed, the festival of death and renewal (of death only in the eyes of some, whereas others consider Samhain to be a festival of scholars) continued to seek out souls to remove from the physical world. While my grandmother's passing was not so unexpected at 92 years of age with failing health (it was an obvious blessing toward renewal of life for my grandmother even as it was a loss for my family), a woman's husband at work died unexpectedly the very next day, Thursday evening November 1 (may she be comforted by the kindness extended to her by our coworkers). Both she and her husband work(ed) at the facility where I work. I went back to work on Monday, but after additional work was piled onto me, along with work associated with the end of the month close (which was completed Monday morning before it was due Wednesday), with the recent passing of my grandmother, my body developed an allergic cold/flu yesterday, Tuesday morning at work. I sneezed continuously the entire day, despite a second dose of newfangled Actifed, becoming lightheaded, feverish and physically weak. So, Tuesday afternoon, I went home early, loaded up on Robitussin nighttime multisymptom cold medicine and went to bed, where I dreamt. I dreamt of dark lethal storm clouds passing over my locations, from east to west they were moving even as they filled the sky. At one point there was a small break in the cloud cover, but it was only for a short time, while we took care of business. I wanted to wait out the storm on the main floor of my house (which was a house trailer at times) - for some reason I wasn't worried that it couldn't weather the storm. Nevertheless, the man with us (somehow a relative, but I'm not sure who exactly this was) convinced me that it was safer to wait underground in the basement while the dark lethal storm clouds passed over. So, we all went down and waited in the basement as the dark lethal storm clouds passed over. I woke up - to the news of a lethal school shooting in Finland. HELSINKI, Finland (CNN) -- A video posted earlier Wednesday, by "Sturmgeist89", was titled "Jokela High School Massacre - 11/7/2007." "Sturmgeist89" identified himself as Auvinen, and said he chose the name "Sturmgeist" because it means "storm spirit" in German. At least eight people were killed when an 18-year-old gunman opened fire at a school in Finland Wednesday, according to Finnish police. The shooting appeared to have been planned out in graphic videos posted on Internet file-sharing site YouTube. At a press conference this afternoon, police confirmed the dead numbered two girls, five boys and the school's headmistress at Jokela High in Tuusula, a quiet town around 50 kilometers (30 miles) north of Helsinki. The shooter, who police named as Pekka Eric Auvinen, is in a critical condition at Toolo Hospital, Dr. Eeero Hirvensalo told CNN. Auvinen published a manifesto online demanding war on the "weak-minded masses" and pledged to die for his cause. YouTube appeared to have removed 89 videos linked to his account, many of them featuring Nazi imagery, shortly after the incident. Finnish media reported someone posted a message two weeks ago on the Web site, warning of a bloodbath at the school. 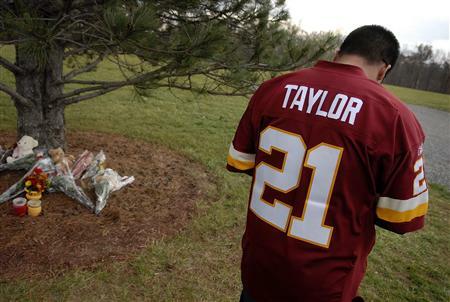 The site indicated that the youth appeared to be fascinated with killing. Throughout all of this, the single word "DIE" constantly flashed across the screen. Other video clips included Nazi-war-criminal footage. In the rambling text posted on the site, Auvinen said that he is "a cynical existentialist, anti-human humanist, anti-social social-Darwinist, realistic idealist and god-like atheist. "I am prepared to fight and die for my cause," he wrote. "I, as a natural selector, will eliminate all who I see unfit, disgraces of human race and failures of natural selection." Thank Goddess! for the cold I developed through this 11/7/2007 day, astronomical Samhain. The following story reported in Foxnews today reminds me of Pharaoh's decree to throw all the Hebrew baby boys into the Nile. Only, in this contemporary case, it was a girl-child. HOUSTON (AP) — Authorities have released a sketch of what they think a young girl, whose remains were discovered inside a storage box that washed ashore on Galveston Bay, looked like. Investigators also said a forensic dental examination has narrowed the girl's age to between 2 and 3 years*. The girl, whom police call "Baby Grace," is described as white, 32 to 35 inches tall and weighing 25 to 30 pounds. She had waist-long, wavy blond or light brown hair. She was wearing a Target-brand pink, flowing skirt, a pink or red shirt and white light-up tennis shoes with purple flowers on them. A fisherman found the girl late Monday night. Her body was inside a blue plastic utility box that washed ashore along the Intercoastal Waterway. Anyone with information is asked to call the Galveston County sheriff's Office at 409-766-2222, the agency's tip line at 866-248-8477 or any Crime Stoppers organization. *In contrast to my vision of "body parts", experienced between the ages of 3 or 4. 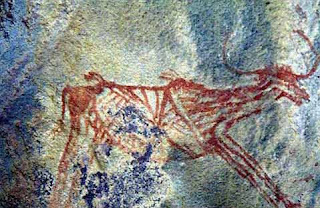 In the vision mentioned here, I "saw" the upper portions of the bodies and the faces with red eyes. Apparently, my primary email service provider has deleted or lost my entire inbox at liorah@net66.com. They are and have been experiencing technical problems and power outages throughout today. Until further notice, please direct any email inquiries to me at liorahchanah@yahoo.com. UPDATE: My primary email service is up again and my inbox restored. There are 1 hexagram and 3 pentacle entries, for a total of 4. These numbers bring to mind the 3 or 4 phenomenon discussed in other entries throughout Walking On Fire.